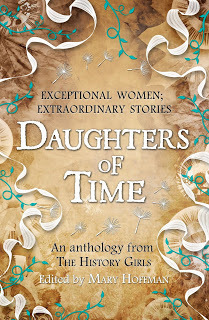 Daughters of Time: blog tour! I grew up in a country without a king or queen, so the life of Elizabeth Stuart, daughter of a king, who was to become a queen herself, seemed like something out of a fairy tale. I was fascinated by Elizabeth’s lack of pretence – that she refused to dress formally for her portrait for Frederick, and left her hair wild and untamed. For her wedding she adopted the same fresh approach and despite the custom of the time and her mother’s rigid adherence to formal dress, she wore her hair long and dishevelled down her back. I like her playfulness and boldness – she was prepared to dress as a boy to be allowed access into her brother’s rooms when he was ill. And I like her determination. It was unusual for a young princess to marry someone she truly loved. Elizabeth almost followed the true fairytale princess format story in that, after her marriage, she went to live in a beautiful castle in Heidelberg, where Frederick built her a monkey house, an aviary, a menagerie and an Italian Renaissance garden. I visited Heidelberg Castle some years ago and wandered around those same gardens without knowing that one day I would write the story of a young girl who lived there nearly four hundred years earlier. This entry was posted in Uncategorized and tagged Blog tour, historical fiction on March 6, 2014 by keithbwalters.